India is a status quoist power. This is easier to establish in terms of its approach to territory. It appears to have reconciled to the fact that some of its territory is occupied by neighbours, Pakistan and China. While rhetorically it is inclined to see the return of this territory, it has not taken any military or political steps to bring this about. However, it would not like to see any more territory lost to neighbours and on this count has a credible military in place. However, is India politically a status quoist power? Politically, it is an emerging power. A regional power, it is now also a power of reckoning in Asia. This can be easily seen from the busy diplomatic schedule of the new prime minister in his first year. Its growing economic clout, self-evident from the finding that it has displaced China as the fastest growing economy, is being translated into political power. Its growing economy is also enabling military power, with it being the largest importer of weapons over the past decade and having its defence budget touch $40 billion this year. This makes India’s position as a regional power unassailable, thereby partially sustaining the proposition that it is politically a status quo power. However, India is also demonstrating assertiveness as a power under the new National Democratic Alliance (NDA) government in Delhi. The strategic refrain of the political forces currently in government when in opposition during the preceding United Progressive Alliance (UPA) regime was that India was not measuring up to its weight. It was constantly reactive and on the back foot. Such arguments came to a head in the wake of the 26/11 attacks in which India did not respond militarily. When elected via a majority in the lower house for the first time in two decades, the government has attempted to distance itself from the strategic policies of its predecessor. The most visible manner it has done so is in the way it cancelled the talks with Pakistan last August and engaged in a prolonged standoff with that country on the Line of Control (LC). Even while engaging China, it is clear from its stance with Japan, the US, Vietnam and Australia that it is hedging its options even if not part of the containment of China. The recent outreach by the prime minister into the Indian Ocean Region, backed by rhetoric of India as a security provider, indicates the direction of the future. Cumulatively, these are suggestive of an Assertive India. This means that it is not quite a status quoist power politically, but would like to see a change in the status quo with India acknowledged as a pre-eminent power in the region and one with a continental role in Asia. The former implies distancing from Pakistan decisively and the latter implies measuring up to China, if not substantially, at least nominally and perceptually. Therefore, the short answer to the question is that politically India can be counted as a quasi-revisionist power. It is a truism that the strategic doctrine of a status quoist power is different from that of a revisionist power. The former tend towards the defensive and defensive-deterrent end of the doctrinal continuum, whereas the latter’s strategic doctrine can be situated towards the offensive and offensive-deterrent ends. The continuum can be imagined with defensive at one end and compellence on the other, with defensive-deterrence, offensive deterrence and offensive, as three mid-course stops (See Figure A below). 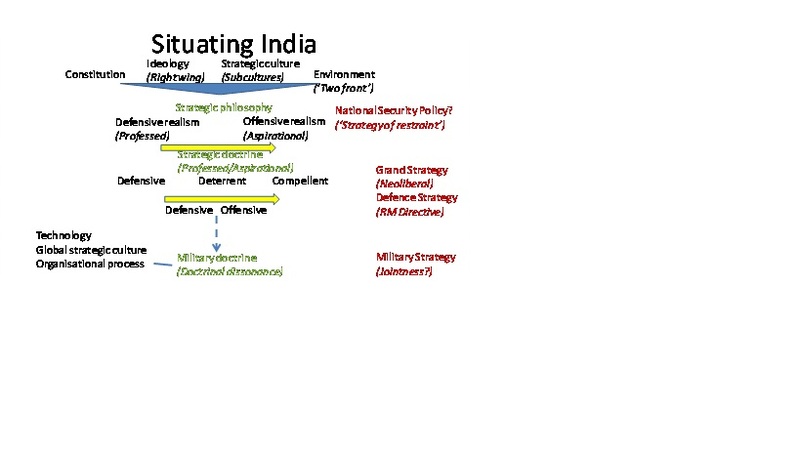 This framework informs this review of India’s strategic doctrine. A discussion of strategic doctrine is a necessary prelude to discussing military doctrine since the former informs and determines the latter. An offensive strategic doctrine finds expression in and is reflected by offensive military doctrines. The popular image is that India is a status quoist power and its strategic doctrine is one of defensive deterrence. However, there are two very diverse adversaries that India contends with. Therefore, it has a differentiated strategic doctrine: in effect two strategic doctrines. With respect to China, India would readily accept that it moved from a defensive strategic doctrine to a defensive-deterrent one. At the conventional level the mountain strike corps is evidence a credible defensive-deterrent doctrine. At the nuclear level, the long range Agni series and the efforts for a ‘boomer’ underway indicate firming in of such a doctrine. India’s foreign policy confabulations with the US, Japan, Australia and Vietnam are also indicative of this. This is the case for the moment. However, taken cumulatively, the three – conventional, nuclear and foreign policy – enable a potential turn towards an offensive-deterrent strategic doctrine. An invulnerable second strike capability, a deepened strategic relationship with partner US and maturing of the mountain strike corps in terms of equipment and infrastructure needs met, could by end of the decade position India at a juncture of choice between the defensive-deterrent and offensive-deterrent. 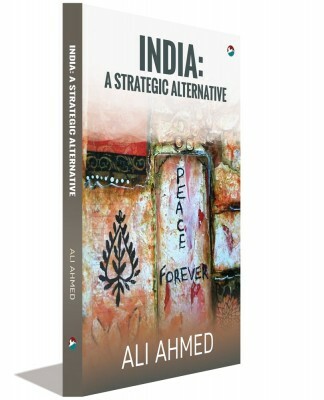 It is here that the preceding discussion on India’s positioning as a status quo or revisionist power comes in. A revisionist India, one with a self-image of an Asian power, if not a great power itself, would want an Asian balance of power reflecting this image. This would imply greater involvement in the strategic games afoot in Asia, pitching it at odds with China and in the US camp, even if today the refrain is one of multi-alignment. An offensive-deterrent can be envisaged once all the enabling elements are in place. 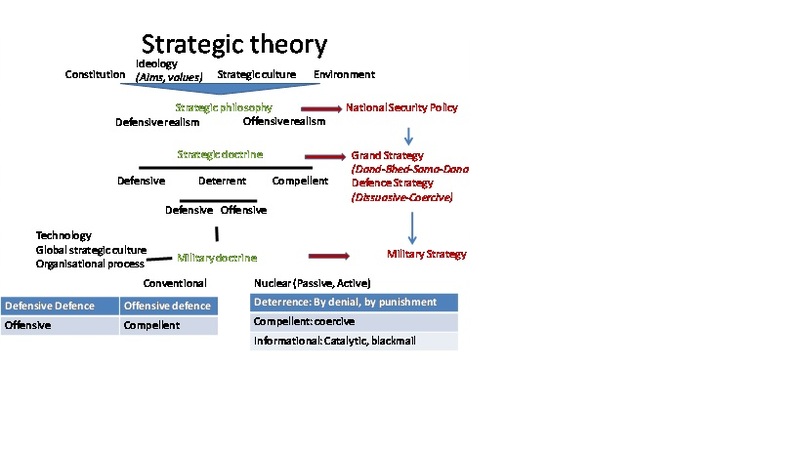 The current defensive-deterrence is for the interregnum (See Figure B below). In respect of Pakistan, the 1965 War fifty years back was the juncture at which India moved decisively away from a defensive strategic doctrine. 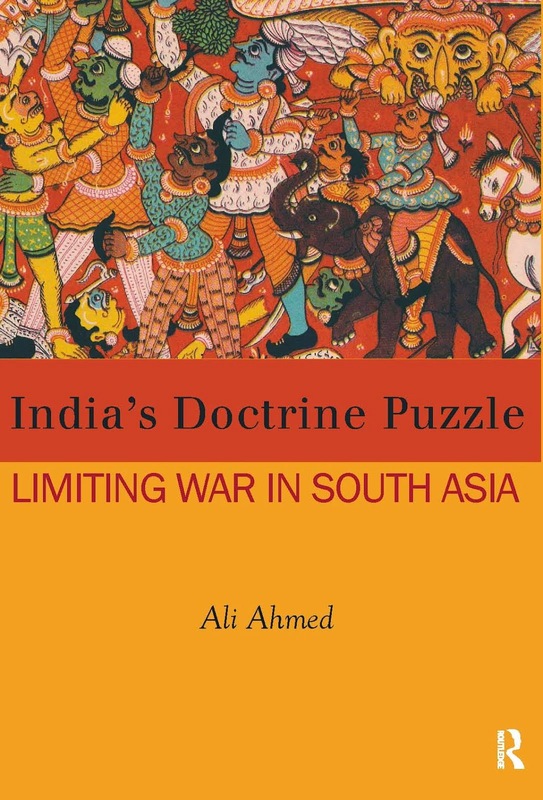 The subsequent war in 1971 is evidence of an offensive inflection in India’s strategic doctrine before it once again settled back into one of defensive-deterrence. In the eighties and nineties, India’s posture was one of conventional deterrence by denial through its holding formations and punishment in the form of counter offensive by its strike corps. Its nuclear posture was one of NFU and minimum deterrence, implying counter value targeting but only in retaliation. The Kargil War and Operation Parakram resulted in a shifting away from defensive-deterrence. The question is whether this is a shift to offensive-deterrence or to an offensive strategic doctrine. In the NDA period the shift towards offensive was made, with changes in both the nuclear and conventional doctrines. The nuclear doctrine that preceded the conventional doctrine created space for conventional operations by positing ‘massive’ nuclear retaliation in case of Pakistan going nuclear even in face of conventional pressure by India. The conventional doctrine – dubbed ‘Cold Start’ - was made proactive and offensive. Even if mindful of potential nuclear thresholds, the nuclear deterrent posture was to enable heightening of any such thresholds. Together the two spell an offensive strategic doctrine rather than an offensive-deterrence one. The NDA displaced soon thereafter led to the new offensive strategic doctrine being still born. Hypothetically, the NDA could if reelected could have employed the ‘carrot and stick’ strategy to get Pakistan to heel, by using the two doctrines – military and nuclear – as stick while the Vajpayee opening up to Pakistan was the carrot. In the event, the UPA decade led to a step back from the offensive strategic doctrine to offensive-deterrence. The strategic doctrine was influenced by neo-liberalism, the wider strategic philosophy of the government. Even though there was no change in the declaratory doctrines, both conventional and nuclear, the government less than enthusiastic in respect of both. There was no political imprimatur to the conventional doctrine and the government was less than forthcoming on equipment demands, as the preparedness profile of the army in wake of 26/11 demonstrated. At the nuclear level, the critique of the ‘massive’ nuclear retaliation formulation was allowed to play out, discrediting the nuclear doctrine. The nuclear status quo did not matter since the government did not have an offensive strategic doctrine involving ‘Cold Start’ conventional offensives in first place. It was not a defensive-deterrent strategic doctrine either in light of the unmistakable offensive content in conventional doctrine and continuity in nuclear doctrine despite its lack of credibility. Further at the nuclear level was continuing work on missiles and warheads which when viewed against the discredited ‘massive’ nuclear retaliation formulation meant a move away from the ill-thought out formulation. As to whether the move away was back to the safety of the earlier mantra of ‘punitive’ nuclear retaliation or further to not discounting a nuclear warfighting is moot and can only remain unknown for lack of evidence. The latter - a move towards nuclear warfighting involving lower order retaliation for lower order nuclear first use by Pakistan, such as employment of nuclear armed Nasr – cannot be ruled out owing to such a response being non-escalatory and assured. This indicates an offensive-deterrent strategic doctrine was in play in the UPA period as seen from the two doctrines – conventional and nuclear. This finding is buttressed by the fact that there was no move in the Manmohan Singh years to coerce Pakistan, despite some grievous terror attacks targeting Indian interests such as at Mumbai and Herat. Even the intelligence game, cited frequently by Pakistan as targeting it, was caliberated at a level to sensitise Pakistan to its underbelly with a deterrent intent in respect of its proxy war in Kashmir. It was therefore not an offensive strategic doctrine. The discussion brings one up to the current Modi era. The question is whether in light of the projection of itself as a decisive government that is strong on defence, the strategic doctrine is one of offensive-deterrence, offensive or one of compellence. What is Assertive India’s current strategic doctrine? What are the potential strategic doctrines for the future? There is no question that a qualitative change has taken place with the advent of BJP to power with a parliamentary majority for the first time in a quarter century. This along with the government’s year long distancing from its predecessor in terms of optics and its projection of the prime minister as a decisive leader are indicative of a different India from hitherto fore. In its first year it has concentrated on strengthening fences, even more so than on the economy. In fact it would appear that the economic card of ‘Make in India’ has the defence industrial sector as key. Its foreign policy activism, being tough with Pakistan and taking a stand on the border issue with China are evidence of an Assertive India. The National Security Adviser (NSA) has articulated the intelligence possibilities of Balochistan, if only to deter Pakistani interference in Kashmir. The ‘terror boat’ incident off the Gujarat coast at the turn of the year indicates preparedness. It has hinted at organizational changes in the offing, such as the Permanent Chairman of the Chiefs of Staff Committee that the previous government ignored despite its own committee, the Naresh Chandra Task Force, advice on the matter. The strategic doctrine of the government has remained unarticulated so far. This is of a piece with India’s strategic culture and precedence. It can only be inferred from statements of higher appointments and actions on ground. The measures that make for an Assertive India are suggestive of a shift in strategic doctrine from the offensive-deterrent to an offensive strategic doctrine. Is this reflected in military doctrines: nuclear and conventional? In the campaigning season last year, it was suggested that the nuclear doctrine would be up for revision. However, since India, as part of its hedging against China is also courting Japan, nuclear doctrine revision has been shelved. This does not mean that it is not underway, in that while declaratory doctrine could remain unchanged, the operational doctrine could be tweaked. With Prahaar posing as India’s answer to Pakistan’s Nasr, it can be taken that India potentially has lower order retaliatory strikes to Pakistani nuclear first use. Its movements towards operationalising the boomer on both fronts - nuclear power and nuclear armed submarine – enable it to move beyond the ‘massive’ formulation since it will by end decade have invulnerable second strike capability. On the conventional front, the go-ahead to the Army on the LC can be taken as reinforcing conventional deterrence. While the measure was useful from point of view of deterring proxy war action during election season in Kashmir, it also is a message of offensive action on India’s part in case it is provoked by mega-terror attacks. In the event, that India has not been challenged so far is a positive. Also, feelers from the Pakistani army are largely that it is not averse to Nawaz Sharif taking the India relationship further. The downside is of a commitment trap in which India is forced to match its rhetoric and Mr. Modi is to live up to his image when and if tested by just such a terror attack the strategy is designed to deter. Will India in this case behave differently from the Manmohan Singh government when faced with 26/11? Based on the foregoing the plausible answer to this question is affirmative. It would appear that India may take coercive action in such a case. This need not necessarily be military led. India’s NSA’s intelligence background enables prioritization of other instruments of response. The suggestions in Pakistan of an Indian hand behind Pakistani discomfiture from terror attacks indicate that this lesser known option is a live one. During the Manmohan years a constant refrain from former intelligence officials was underdevelopment of this option. The usual reason cited was that this was taken off the table by Inder Gujral who had excised the capability. That Mr. Manmohan Singh had ineptly allowed Balochistan to figure in his Sharm es Shaikh declaration with Zardari had made his reaching out to Pakistan after 26/11 a dead initiative. It had been pilloried in intelligence circles. Therefore, now that the national security elite and environment is more receptive and Pakistan revealed as more vulnerable after the Peshawar terror attack, it can be expected that the intelligence option figures prominently. Plausible deniability that Pakistani hid behind in the heyday of its proxy war is a card that can now be turned against it. Diplomatically, Mr. Modi’s shuffle of bureaucratic hand in the foreign ministry alongside enables a diplomatic offensive. Obama’s Republic Day visit on invitation to India and Mr. Modi’s impending China visit can help with isolating Pakistan. This implies that the military option is not necessarily the default option. The Cold Start doctrine is now into its second decade and can be expected to be considerably practiced. The equipment shortfalls are being remedied by the government with one of its first major decisions last August clearing Rs 17000 crores of acquisitions. Since this will take time to materialize, India’s military option can be expected to take a back seat so as to avoid a repeat of the post 26/11 scenario in which its army chief reportedly pointed to equipment shortfalls on being asked after a military response. A military option is particularly risky in terms of outcomes. Inability to prevail could lead to escalation impetus from within the Indian side. This would imperil over the long term the developmentalist plank of the government. It would also expose it to embarrassment if it exposes lack of strategic finesse. The military reforms such as levels of jointness necessary for such operations have not been undertaken yet. There are no indicators in open domain as to whether the government has ironed out the issues roundly critiqued in both the conventional and nuclear doctrines. It is hardly likely to chance the military instrument with unrevised doctrines it has not had time to familiarize itself with. It would also be more difficult to sustain diplomatically. The China factor cannot be discounted. Therefore, the military option can better serve to deter rather than be deployed if it comes to the crunch. What is the potential strategic doctrine of the new regime? 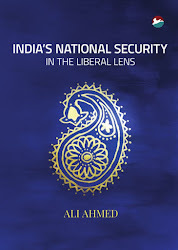 Once all the military cards are on the table in terms of doctrinal revision, organizational reform and equipment acquisitions, possible by end decade and in the prospective second term of the current NDA government, it is possible for India’s strategic doctrine to move up a notch. On the Pakistan front, this could be from the offensive strategic doctrine today to a coercive and compellent strategic doctrine. For China, an explicit offensive-deterrent can be envisaged with acquisitions in the offing in terms of mobility and firepower for the Mountain Strike Corps. The direction of India’s US relationship, including its military-technology prong with US displacing Russia as India’s largest arms exporter, is such as to make primarily for a force projection capability. This is in keeping with US’ expectations of India in the relationship, currently couched in the security provider framework. This will be the culmination of Assertive India and signal its ‘arrival’ as a Great Power. To sum up, this article has made the case of a shift up the strategic doctrinal continuum by India. In the UPA period, India placed at the interstices of defensive-deterrent and offensive-deterrent juncture of the spectrum. In the second NDA period, an Assertive India has been posited. The implication of this is a movement in strategic doctrine up one notch to an offensive strategic doctrine in respect of Pakistan and offensive-deterrent in respect of China. The multiple defence related measures in place by the new government suggest a potential movement towards a compellent doctrine in respect of Pakistan and an explicit offensive-deterrence in relation to China. Previous governments have not been inclined to articulation of strategic doctrine. This owed to India’s unstated strategic doctrine being slightly more reliant on force than India’s strategic professions would have it. India’s present government has no such inhibitions. Therefore, its stepping up to acknowledge the strategic doctrine attributed here to it is possible to envisage. This should be encouraged by calls for a national security policy white paper or open domain periodic strategic reviews. This will serve deterrence, besides conditioning the government to the underside of the offensive-compellent direction it appears headed.